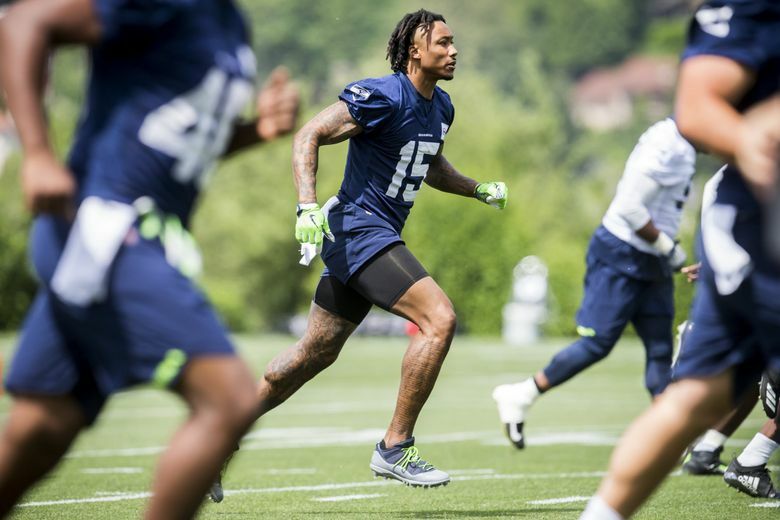 Seahawks mailbag: Who will win Seattle’s most intriguing position battle — wide receiver? Doug Baldwin, Tyler Lockett and Jaron Brown are locks, but the battle for the final few roster spots at receiver looms as intriguing as any other for the Seahawks. A: I made a guess at how I see it unfolding in my latest 53-man roster projection published earlier this week. I had six receivers on the 53-man roster — Doug Baldwin, Tyler Lockett, Jaron Brown, Brandon Marshall, Amara Darboh and David Moore. But while I think the first three are locks, each of other three will have to show some things to make it. Marshall is a real wildcard. If the 34-year-old can turn back time at all — recall that he also had surgeries on his ankle and toe last fall and Marshall seemed to indicate that assuming recovery goes well he could be healthier than he’s been in a few years — then the Seahawks might have one of the steals of the NFL season. But if Marshall just looks old and slow then the Seahawks won’t have any issue waiving him since he has only $90,000 guaranteed. Darboh and Moore — third- and seventh-round picks last year, respectively — will be given every chance to prove to the Seahawks they made the right move taking them, and in the case of Moore also elevating him to the 53-man roster late last season to keep him from signing with another team. The 6-2, 218-pound Moore earned some pretty heady praise from coach Pete Carroll during minicamp, and while all coaches tend to wax optimistic this time of year — Carroll as much as anyone — the enthusiasm Carroll expressed for Moore indicated if nothing else that the team has high expectations for him this season. Darboh’s third-round status in 2017 and what he did at Michigan also means he’s likely to have a pretty long leash. But there are some intriguing candidates who will push those three. One of the more interesting is Marcus Johnson, acquired from the Eagles in the Michael Bennett trade. Johnson, listed at 6-1, 204, played in 10 games for the Super Bowl champs last season (though none in the post-season) with five catches for 45 yards. But the Seahawks have been enamored with Johnson since his days at Texas, where he ran a reported 4.39 in the 40. After a couple of quiet days early during OTAs and minicamp, Johnson stood out during the final minicamp practice, including making one long catch during a team session. The Seahawks also view him as potentially having a big special teams role — his speed could make him an ideal gunner on coverage teams (some around the team have compared him to Ricardo Lockette). Indeed. But there are a few others. Tanner McEvoy, who has made the team the last two years after arriving as an undrafted free agent, also remains a legit candidate to make the roster, in large part due to his special teams value (he had the third-most special teams snaps of any Seahawk last season). McEvoy, though, will need to show more consistency receiving (he had pretty ill-timed drop early in the season last year against the 49ers and then an even more ill-timed fumble against the Rams late in the season) to hold on to his spot. Keenan Reynolds, a former option QB at Navy who is attempting to forge an NFL career as a receiver and returner, earned plaudits from Carroll for his play during training camp after having signed with Seattle as a free agent in mid-May. Reynolds would seem a longer shot than the players listed above — at 5-10, 191, he doesn’t offer the size of the likes of Moore, Darboh and McEvoy that might give some of them the benefit of the doubt. But he could help himself greatly if the team views him as a legitimate return candidate. Also intriguing is one-time UW Husky Damore’ea Stringfellow, who was signed as a free agent shortly after the draft. The Seahawks like the size of the 6-2, 209-pounder, who appeared to be used largely in the slot during minicamp, where his height and weight might make him even more of a matchup issue for opponents. Also on the roster are undrafted rookie free agent Caleb Scott of Vanderbilt and Cyril Grayson, a former track star at LSU who was also in camp with the Seahawks last season before being released and then re-signed. Scott had an injury in minicamp and didn’t get any reps so it was hard to get a sense of what he might add and Grayson remains a work in progress as he attempts to transition from college track star to football. At the moment, each would seem to be pretty deep longshots to make it, especially with the apparent depth elsewhere. What we do know is that a receiver position a lot of NFL observers regard as a question mark, given the loss of Paul Richardson (and tight ends Jimmy Graham and Luke Willson) has a lot of questions waiting to be answered. A: Sharp. Like the song says, Always and Forever.